Both Rhonda Walls (right) and her daughter, Melinique Walls (left), went through rites of passage this fall when Melinique stepped on to the Washington University campus as a freshman. For Melinique, that rite of passage was spreading her wings to fly. For Rhonda, it was letting go so her daughter could soar. Rhonda Walls is a wife and mother of three, living in north Mississippi. 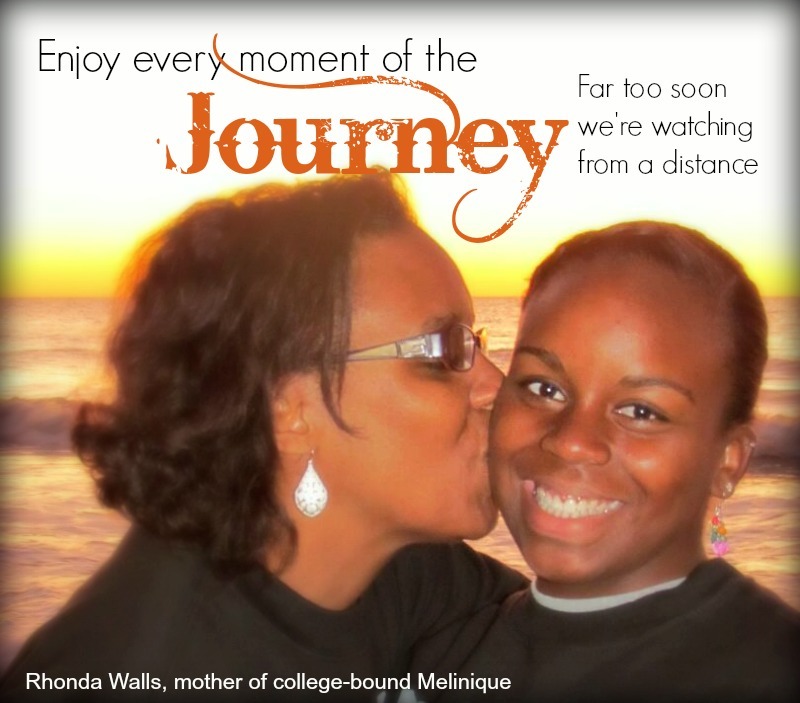 In this essay, she graciously opens her heart to share a mother’s journey as her first child, daughter Melinique, goes off to college. From that moment, maybe even sooner, my husband and I were preparing each other for the day when our firstborn would strike out on her own. That day is here now and it doesn’t seem that the 18 years was long enough to prepare me. My daughter, on the other hand, is more than ready. The journey to accepting that has not been an easy one. The most telling sign that I was not ready was when my daughter left for her very first college tour, 1,800 miles from home! I was in bed for two days and didn’t even realize it. Sure, I put her on a plane and knew that a trusted family member would meet her on the other end, but was she seriously considering going so far from home? Was this a sign that she was trying to escape? Had we done something wrong that had her exploring an option so far away? I listened as she shared the excitement of what she liked and what was lacking. I secretly priced flights, determined that there would be frequent visits if this was going to happen. I tried to plan for emergency scenarios. Not once, I think, did I reveal to her just how close I was to hyperventilating at the thought of her being so far away. Oh happy day! An amazing offer came from a school that was only 490 miles away. I was ready for this one. We loaded up the mom-mobile and headed out. Her eyes lit up as we approached the campus. Did this happen when she visited the school so far away? Did she have fears about being so far from home that she didn’t share with me? Hmmm. I needed to get it together and do my part. We had a personal tour and I could really picture her loving this campus. The dorm was better than my first apartment. The activity opportunities were endless. My social butterfly would have endless opportunities to spread her wings. I’m a little (very little) ashamed to admit that I may have been a bit over the top with my excitement about this school. She couldn’t come home every weekend, but I could get to her within hours of an emergency. As our mailbox continued to overflow with offers from schools near and far, I realized that the possibilities really were endless. She was experiencing what every student and parent dreams. I needed to embrace this. Sure enough, she finally explored options closer to home, including one that would allow her to eat dinner at home as often as she liked. I don’t think that one really ever had a chance. She asked questions; she looked at programs; she connected with students; and she…did everything that let me know that she was very aware of the importance of this college decision. That knowledge brought me peace. The day finally arrived. She made her choice. She won’t be down the street, but 300 miles isn’t so far. It’s finally time to prepare. I’m thinking about sheets and towels. She is taking placement tests for courses. Has it really been that long since I made this journey myself? I don’t remember placement tests or summer reading assignments. Dorm assignments are in, and suite mates are communicating. Slowly but surely, the wings are spreading, and they are beautiful. As my living room starts to look like a dormitory room, I am reminded of the physical preparation. Are we forgetting anything? Freshman can’t have cars. What if it rains? What if it snows? I guess that I am still working on not hyperventilating. Slowly but surely, I realize that I, too, am ready for this new journey. The truth is that she has been rather independent under my roof for quite some time now, while making some pretty great choices for her future. I realize that I am actually excited to hear about her new experiences and how her life is changing and growing. I am looking forward to her coming home unexpectedly, requesting a favorite meal, and, yes, even bringing her dirty laundry. I recently had a mom of a senior ask if I had any advice on how they should prepare for their own daughter’s senior year. Talk about coming full circle! I am now that mom; the one who can offer advice. I told her to enjoy the journey. Enjoy every moment of the journey. Far too soon we are watching the butterfly from a distance and fully appreciating her in all of her wondrous glory. As a final tip, I came up with the brilliant—if I do say so myself—idea of making sure that my daughter had a little piece of home with her at all times. During her trunk party, I gave everyone a blank notecard and asked them to give her words of encouragement. I also keep these in my car, to ask the same of friends and family along the way. I asked that no one write anything on the outside of the card. I plan to place these in a beautiful box and send them to school with her as a gift that will keep on giving. When she has a rough day or just has a longing for home, I want her to be able to open a card from someone who cares about her and feel a hug from home. Enjoyed Rhonda’s account and her sharing emotions and thoughts that brought back the many times I, too, had to let go of such precious blessings! Thanks Rhonda!